Designed by U.S. artist Trevor Paglen, the Orbital Reflector was launched to low Earth orbit aboard a SpaceX Falcon 9 rocket on December 3, 2018, along with dozens of other cubesats. But this $1.5 million art project, which also involved the Nevada Museum of Art, Spaceflight Industries, and Global Western, is now stuck in a holding pattern thanks to the U.S. government shutdown. With the U.S. Federal Communications Commission (FCC) out of commission, Paglen cannot get the required green light to unfurl his giant space balloon, as the New York Times reports. Orbital Reflector is made from a lightweight material similar to mylar. When unfurled and fully inflated, the sculpture will attain an elongated diamond-like shape, roughly the length of a football field. A highly reflective coating of titanium dioxide means the sculpture should be visible to observers on the ground. 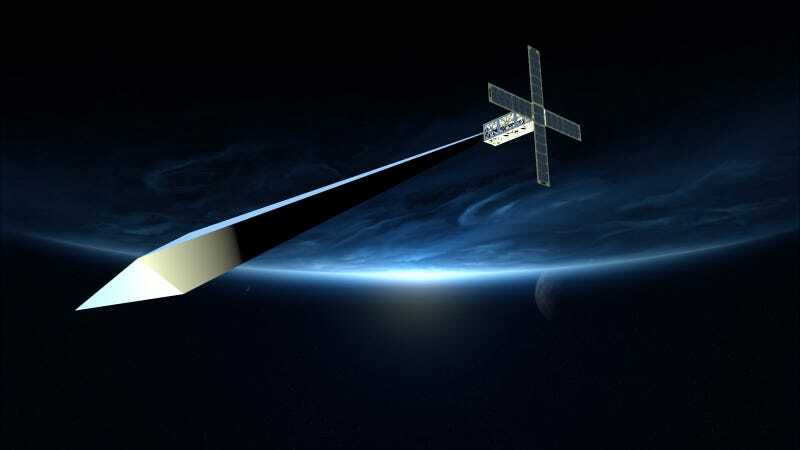 Orbital Reflector wasn’t meant to exist in space for very long, and it’ll eventually fall into Earth’s atmosphere and burn to crisp after a few months in orbit. Mr. Paglen said that [after the launch and deployment], his team did extensive “orbital analysis” to ensure a collision-free trajectory and secure F.C.C. clearance to inflate. But communication from the F.C.C. soon ceased because of the shutdown. Of course I feel bad for Paglen, but I must admit I’m also feeling a bit of schadenfreude. I’m not a fan of this sort of thing; surely looking up at the cosmos—just the way it is, without an inflated shiny tube in the way—should inspire in anyone a sense of wonder and contemplation of one’s place in the universe. I also don’t think low Earth orbit is an appropriate place for us to be depositing art projects, and it’s starting to get a bit out of hand. The same launch that delivered Orbital Reflector, for example, also deposited artist Tavares Strachan’s Eonoch sculpture-satellite. Last year we had to endure Humanity Star, a small satellite bearing the resemblance of a disco ball. And not to be outdone, a Japanese firm launched a satellite into space last week that’ll be capable of generating artificial meteor showers. Sure, this might seem novel and cool (I personally don’t think so), but we have to consider the costs. Bright objects in low Earth orbit, in addition to potentially interfering with astronomical observations, simply add to the massive collection of debris that could collide with and damage more useful satellites. Sadly, with the price of rocket launches dropping, there’s likely more of this to come.